Entrenched in the cultural legacy of India's Pink City, Hotel Gandharva by Peppermint is the best combination of an upscale hotel experience and environment practices. Our Hotel welcomes guests with refined elegance and contemporary amenities. Our 42 guest rooms offer the combination of comfort and indulgence while contributing to the environment. Stay in the quietest and most energy efficient hotel rooms in Jaipur courtesy of our completely renovated New Age Eco-Friendly Hotel. All our rooms are non-smoking and have the luxury 32″ LCD TV with over 30 channels, individually controlled air-conditioning, work desk, phone , in-room tea and coffee making and mini bar facilities. Hair dryer, iron and ironing board on request. And 24-hour reception and room service and business centre. The hotel provides free Wi-Fi across the full hotel. Please contact the manager reservations desk to find out about our group rates and specials rates. Children below 9 years will be complimentary on plan. Pickup & Drop facility – On request. Located in "Pink City" Jaipur, Hotel Gandharva by peppermint offers the finest blend of affordability, luxury and comfort to guests in Jaipur budget accommodation in Jaipur. Conveniently located near railway station in Jaipur as well as near to bus stand & Jaipur airport, Hotel Gandharva is offering accessibility to shopping hubs, tourist attractions and business centers. 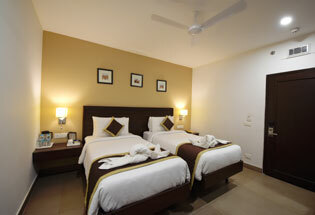 To provide best hotel accommodation in Jaipur, we take every step for an everlasting and memorable stay. We offer the best of facilities and amenities with unbelievably lowest tariff so that you can get budget Jaipur hotel accommodation. So, get ready to experience the fine art of hospitality because we go extra miles to ensure that you can have a great time in our suites. Our courteous and warm staff always look ahead to welcome you. Engrossed in Pink City's cultural legacy, Hotel Gandharva is the best hotel to stay in Jaipur. It combines best environment practices and upscale hotel experience. We welcome our guests to enjoy contemporary amenities and refined elegance. To provide memorable Jaipur accommodation, we have 42 air-conditioned and elegant rooms with the combination of indulgence and comfort. They are designed well to contribute to the environment. Here, you are rest assured to stay in most energy-efficient and quietest hotel rooms. 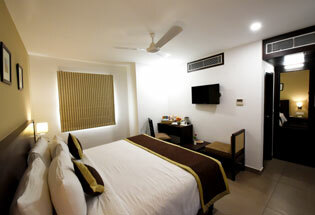 We are proud to offer stay in a well-renovated, modern, eco-friendly hotel accommodation in Jaipur. We have different types of hotel rooms for booking like Deluxe rooms, Premium rooms and Suite rooms at available at different prices. The rooms of our hotel are well organized with best of the cleanliness and have various facilities like TV, Wi-Fi, AC, wardrobe, food from our restaurant & best of the room service etc. Guests can choose the rooms of hotel to stay in Jaipur as per their comfort and financial budget and can contact for special rates and group rates. Your stay in Jaipur at Gandharva Hotel will give you an awesome experience. The staff is well trained for providing best of the hospitality service and this is why we have a lot of happy customers whose positive words motivates us to provide excellent services. Booking Jaipur hotel accommodation at Gandharva hotel will also provide ease to visit the restaurant of the hotel where you can enjoy delicious food and enjoy your breakfast, morning or evening coffee, tea and meals. Apart from this we also have board rooms and meeting rooms where you can do business deals, events, seminars etc. Those who are looking for parties, family events, birthdays, special surprises and wedding functions booking the party hall at Gandharva is an ideal venue. You can books rooms for your guests where they can stay comfortably after events or functions. All of our luxury rooms have 32" LCD TV with up to 30 channels. These smoking-free rooms have mini bar and in-room coffee and tea making facilities, work desk, phone, and individually controlled air conditioning, and ironing board, hair dryer, and iron (On request). 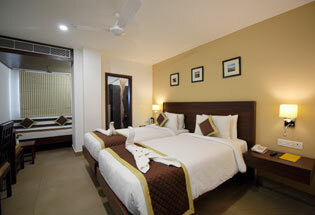 You can always avail 24x7 room service and access to business center and room service. We provide free Wi-Fi access across the whole hotel. Some of the basic amenities we provide in all rooms are telephone, cable TV, chairs, study table and cupboard. The study table has business folder, sewing kit and yellow pages directory.